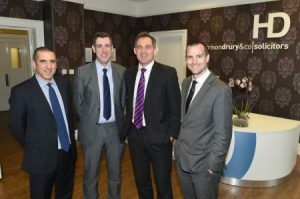 The property and construction team at Harrison Drury solicitors has expanded again as Philip Wright and Daniel Boulton take up roles with the firm. The two experienced commercial property lawyers, who were previously at Napthens, specialise in advising developers, housebuilders, landlords, banks, SMEs and large rural estates. Their specialist expertise includes property development, options, conditional contracts, site assembly, planning agreements, utility agreements, secured lending, site set up, purchase and sale, and landlord and tenant matters.